All transactions are safe and secure with a reliable history in online purchasing behind each of our associates. Buy the One Fish Two Fish t-shirt to own Dr. Seuss clothing and merchandise. The book One Fish Two Fish Red Fish Blue Fish proves that there are plenty of fish in the sea. This well known story has been parodied for years because we are all different colors, different ages and different sizes like the fish. So whether you are a black fish or a blue fish, a thin fish or a fat fish, an old fish or a new fish, these Dr. Seuss t-shirts are sure to catch your interest. Snag one of these tees for yourself or for the special red fish or blue fish in your life. Pair it with a Green Eggs and Ham shirt. 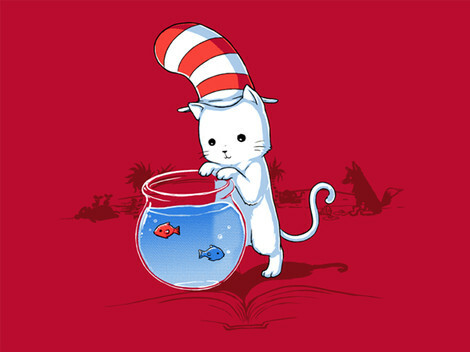 In addition to the One Fish Two Fish tee above, browse the Dr. Seuss Clothing Gallery for more apparel like men's and women's clothes, kids shirts or hoodies.